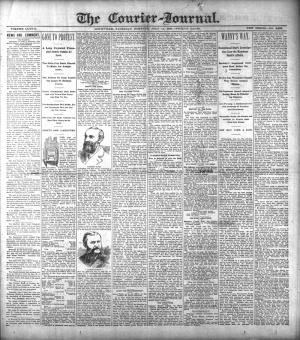 The Courier-Journal is a daily newspaper from Louisville (Kentucky) founded in 1868 from a merge between The Journal and the Courier. The newspaper published 33 short stories, 2 novels (The Hound of the Baskervilles and The Great Shadow) and 2 poems (Cremona and The Groom's Story) written by Arthur Conan Doyle between 1891 and 1927. This page was last edited on 9 September 2016, at 11:24.